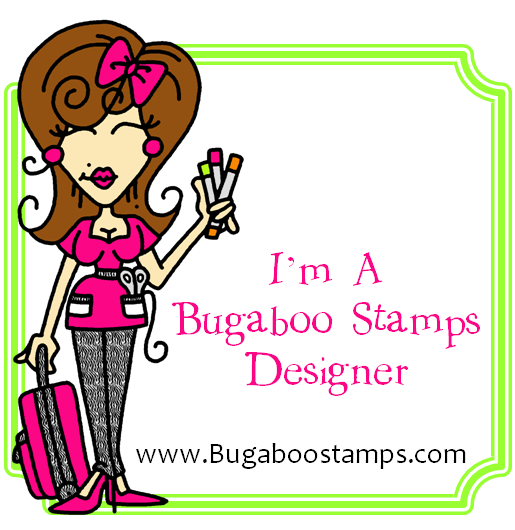 Hello, it's Anything But A Card day at Bugaboo Stamps. For my project today, I used Charlie from Bugaboo Stamps. 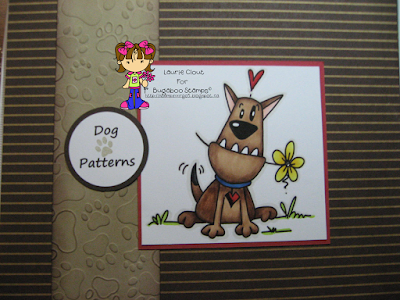 I keep my crochet patterns in binders, and this is a binder cover I made for my Dog Cozy patterns. I coloured Charlie with copics and added a tiny gem to the flower. The Designer paper is Under The Tree from SU. I also used a piece of crumb cake and embossed it with a paw print embossing folder. The title was computer generated and punched with circles. It is 11" x 9.75" and will fit inside the front of a binder. Check out The Catch The Bug Blog for more ABC projects! This is one of the patterns I have in the binder, I made this boxer for my Brother. 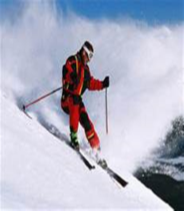 Hello, it's time for a new challenge from Bugaboo Stamps. This week it's a photo inspiration challenge! 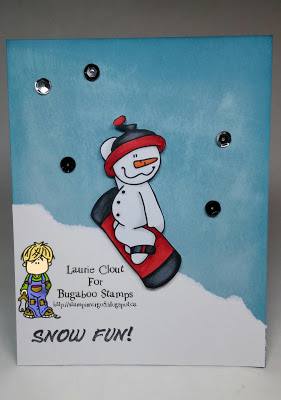 For my card I used Snowman Snowboard 2 from Bugaboo Stamps. I coloured the image with copics and cut it out. The card base is marina mist with a piece of white that I tore to make the snow hill. Before I added the white piece, I used a sponge and craft white ink to try and get the sprayed snow look. Then I just popped up the Snowman and added some sequins. Please join in our challenge and upload your creation to the Catch The Bug Blog! Hello, it's new release day at Bugaboo Stamps, and this is such a cute image called Kidlet-veterinarian! I coloured the image with copics. The card base is white with a layer of paw print designer paper. Then a real red strip and the bone was made with a die-namics die. I also used this weeks Stella Says Sketch SSS503, there's still lots of time for you to enter! Check out the Catch The Bug Blog to see more creations using this image! 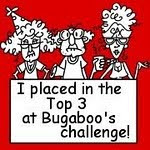 Hello, it's the first Saturday of the month so this weeks Challenge at Catch The Bug is Anything Goes! For my card today I used one of the images from the Birthday Pup Set at Bugaboo Stamps! I coloured the image with copics and added some stickles to the cupcake frosting. The card base is smokey slate with a strip of SU dsp from the stacked with love pad, a strip of blushing bride and a strip of dazzling diamonds glimmer paper. The sentiment is also from SU Something to Celebrate set. 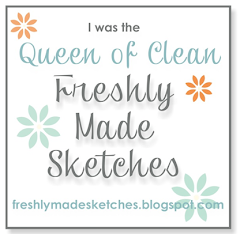 Hello, it's time for another Freebie from Bugaboo Stamps! This little raggedy Monkey is this weeks Freebie! I coloured the image with copics and cut her out. The card base is white, with a layer of real red and then crumb cake. The tag was made with SU dsp and the scallop circle was embossed with the swiss dot embossing folder. 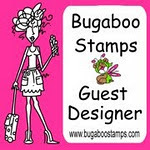 Please check out the others creations on the Catch The bug Blog, and stop by Bugaboo Stamps to get your freebie! Worm Birthday Wishes to Bugaboo Stamps! 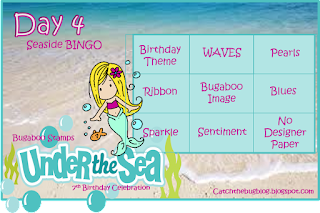 Hello, it's Day 4 of Bugaboo Birthday Bash, and today's challenge is Under The Sea/Birthday Bingo! For my card today, I used the middle line, Ribbon, Bugaboo Image & blues! This is one of the awesome images that will be in this year's new Birthday Set from Bugaboo Stamps, which you could win by entering in our challenges! I copied the image 3 times and coloured with copics. Then I cut the different pieces of the worm and layered them, ending with the head which I popped up. This is a tent topper style card, haven't made of of these in a while! I also dug out my dew drops, another oldie and finished it off with the sentiment and some twine! Please come join in our challenge at Catch The Bug for your chance to win some awesome prizes! 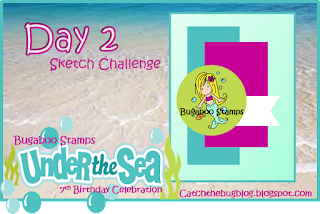 Bugaboo Birthday Bash Sketch Challenge!! 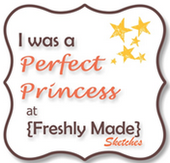 Hello, we have a sketch for you today at Bugaboo Stamps. 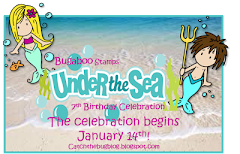 For my card today I used Crab Scuba from Bugaboo Stamps. I coloured the image with copics. The card base is real red with paper from SU Maritimes (I still had it out from yesterday's card). I didn't have a whole lot of sprinkle/shaker card stuff that matched so I used a bit of beads, sequins and tiny pearls! I hope you can join in our challenge and upload your creation to the Catch The Bug Blog! Card Cut Punctuation SVG e-cutting file releases today! Places I Love to Shop!